We are currently very busy calling for papers and planning the workshops and tutorials which will run all of Sunday 21st and Thursday afternoon 25th respectively. The registration page will be released in early June. Our delegates will be visiting a geographical area steeped in dramatic history. In Roman times, Pevensey Castle – just 5.3 miles down the road – was a firm stronghold, and the fortress ruins and the walls around the keep still stands to this day. In 1066, William the Conqueror armed his forces and sailed across the 'Narrow Sea' – to make landfall at Pevensey. From here he marched his troops along the coast to Hastings some 15 miles to the East. He then positioned his army near Battle, 6 miles to the north of Hastings, where the world famous Battle of Hastings took place between the Saxon army led by King Harold and William's Normans on October 14th 1066. 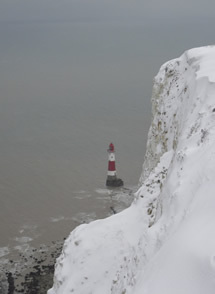 Eastbourne is also home to Beachy Head - the highest white cliff in England. And just 30 min away by train you will find Brighton. You could hop off the train in Lewes – the old Capital of Sussex. Lewes is well worth a visit, and offers both a castle ruin (and a modern day prison) as well as a very steep high street with many antique shops. Back in Eastbourne you will find one of the most beautiful sea fronts in the UK. The promenade is more than 4 miles long and paved. Ideal for roller blading, and walks/runs. But no Cycling! For more information on Eastbourne click here. We are looking forward to seeing you at Dyalog '14 in Eastbourne in September. Oh, and don't forget to bookmark http://www.dyalog.com/dyalog_14/ and check back for updates about Dyalog '14 regularly.